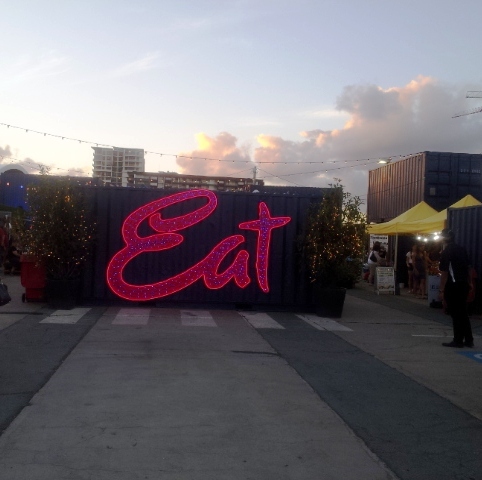 A Great Night out at Eat Street Markets – Brisbane. It is 4 years since I last visited the Eat Street Markets. I said that I would be back, but I had no idea that it would take me so long to return. I don’t even know why it took me so long because the markets are extraordinary. This time we arrived by city cat. City Cat is the Brisbane river transport system with terminals stretching from The University of Queensland at St Lucia to Northshore Hamilton. It was then only a short walk from the Northshore ferry terminal to the markets. Travelling on the City Cat anywhere on the Brisbane river is an absolute delight, both in the daytime and very special at night when you see the abundance of lights along the river banks and illuminating the many bridges. 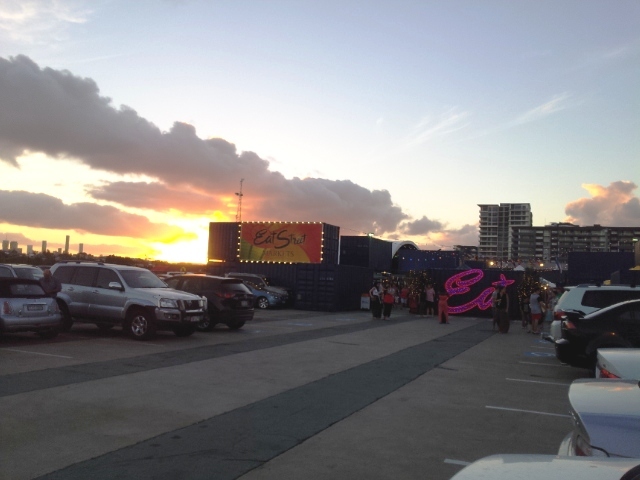 The first time I went to Eat Street Markets, although we arrived quite early, parking was difficult. However, this time, we arrived about 6pm and there were still hundreds of free parking stalls. But, when we left around 9, there were long lines of cars waiting to come in with traffic controllers directing the traffic. The first visit to Eat Street Markets. The Eat Street Markets have moved location since the last time I visited and it was definitely for the better. They were originally near Portside where the cruise liner terminal is, and now they are further down the river in Northshore Hamilton. There is nothing like Eat Street Northshore anywhere in the world. It is a special one of a kind experience. 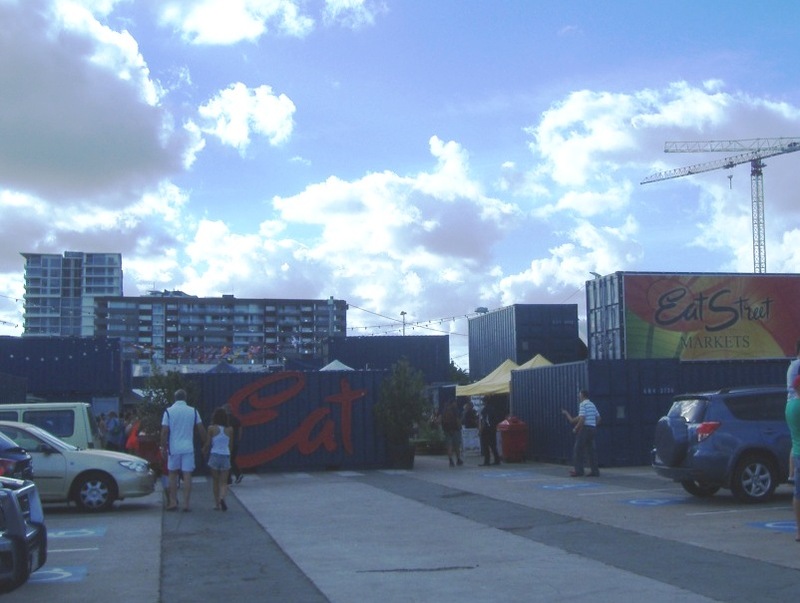 Priceless city & river views saturate & surround the 180 dining and entertainment shipping containers that add a blazing coloured landmark to Brisbane. 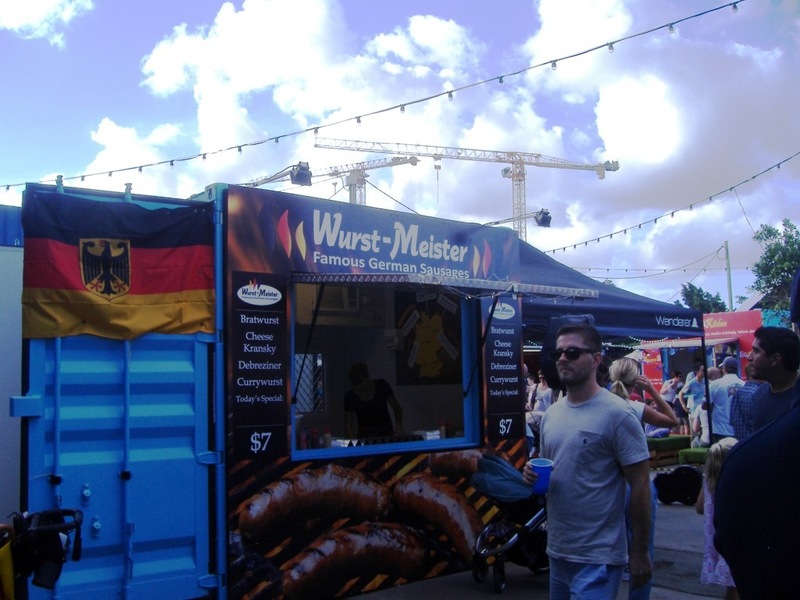 At soon as you walk through the gates in to the area you are hit with the exciting vibe of the place, with its millions of lights, beautiful stalls, people having fun and amazing aromas coming from the many food stalls. There were so many choices of places to eat it was hard to decide. We initially walked around the entire area making mental note of what we thought we wanted to try. We stopped at one of the bars by the river and enjoyed a glass of wine and thought about what we would have for dinner. Then it was deciding time which was hard. But we did decide and we enjoyed the dinner. We each chose differently, my choice was Japanese however we all agreed on the same for dessert. Gelato. 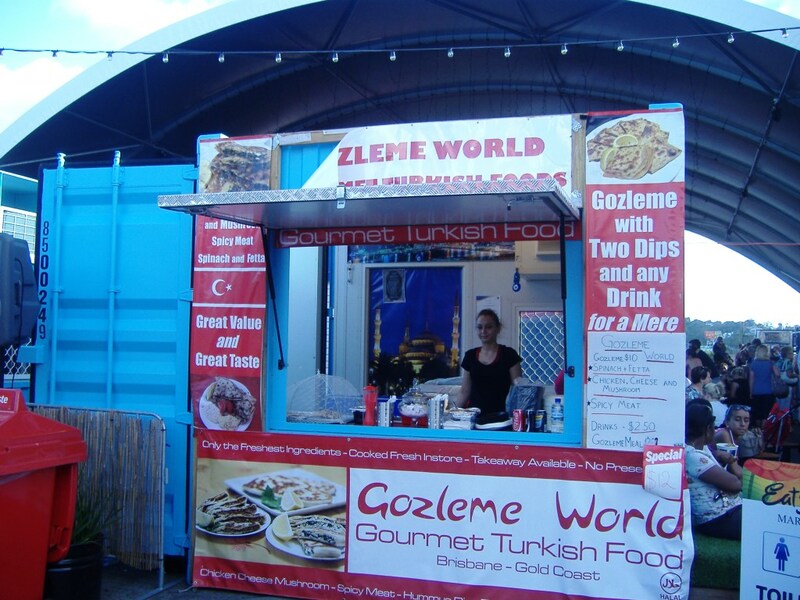 With over 70 vendors creating delicious dishes from all over the world you are sure to find something absolutely scrumptious. Live entertainment fills the markets; Solo performers and bands are positioned throughout Eat Street so you’re never far from music. After dinner we stopped by several of the entertainment areas and sat in comfy chairs to watch the performances. Sunday 12 noon to 8pm. Entry fee is $2.50 – 12 years and older. If you live in Brisbane or visiting at any time, stop by for a visit, you won’t be disappointed. 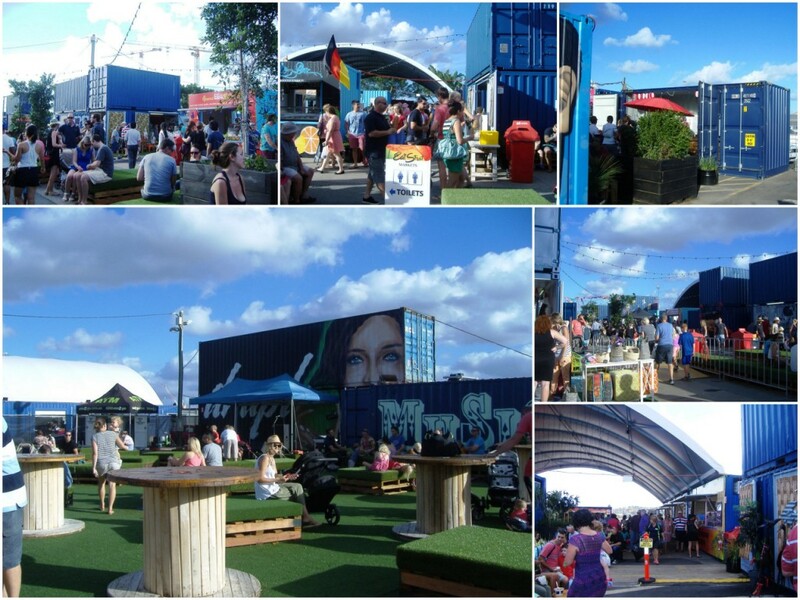 I take my hat off to Brisbane and its latest creation – The Eat Street Markets. 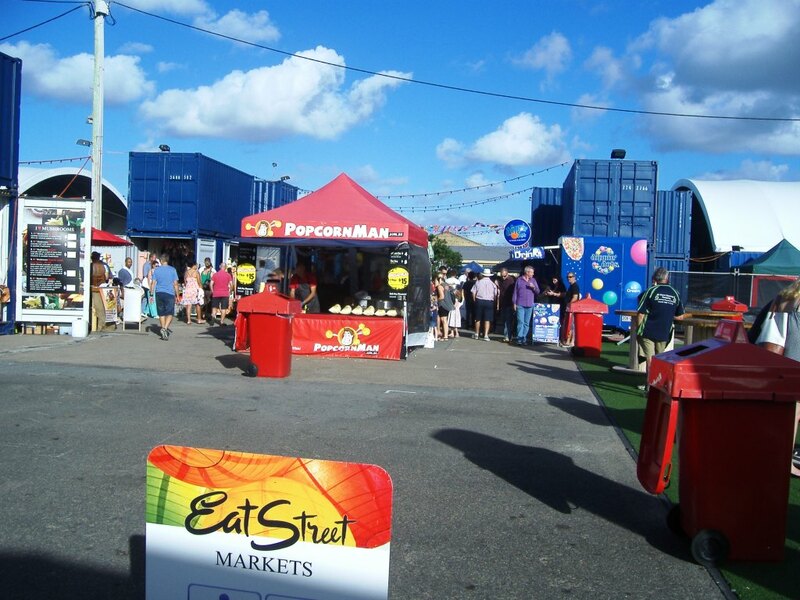 Has anyone heard of the Eat Street Markets? Well It seems that most of my friends have not heard of them but judging by the amount of people who were there on Saturday night it appears that many of Brisbane’s residents know of this fabulous new venture. The reason I know about the markets is from when we were on the cruise in November when Jake and Elle from My Kitchen Rules told us about them. 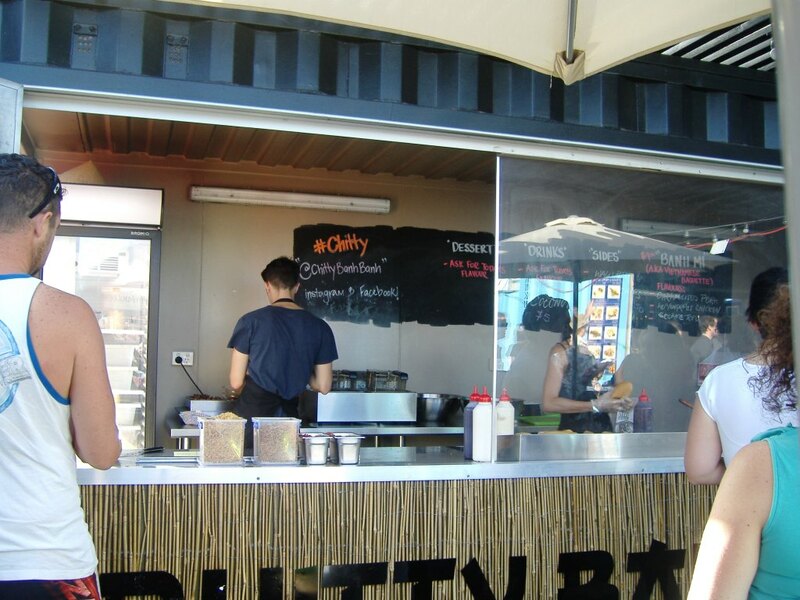 Jake and Elle have a “pop up restaurant” called Chitty Bahn Bahn. 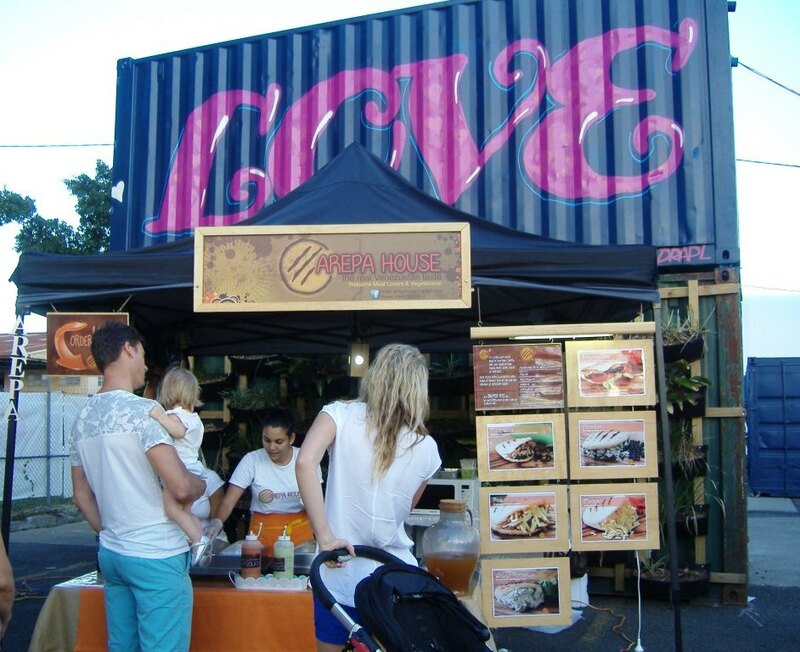 These exciting new Markets is something never seen before in Brisbane. They consist of old specially designed shipping containers which look like they have all been painted blue. 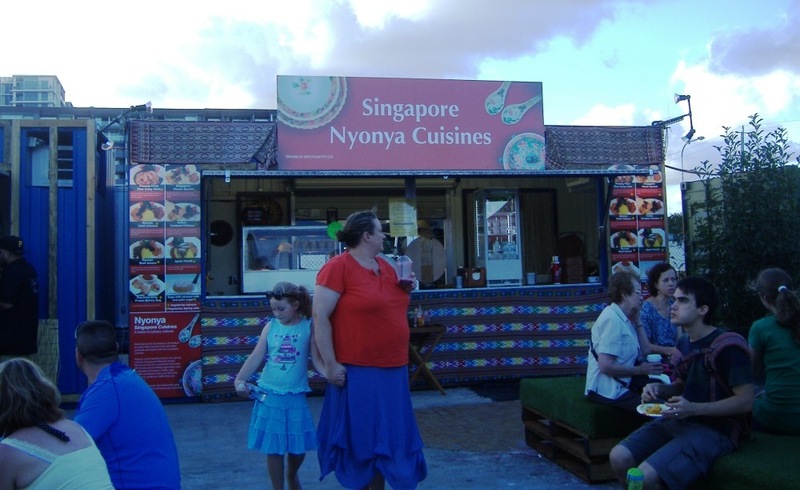 We wandered around the “pop up stalls” and the “pop up restaurants”. There are plenty of places to sit as there are funky seats and tables everywhere. It is a great place to mingle, listen to the live bands, have a drink at one of the several pop up bars, enjoy a snack or a complete meal. 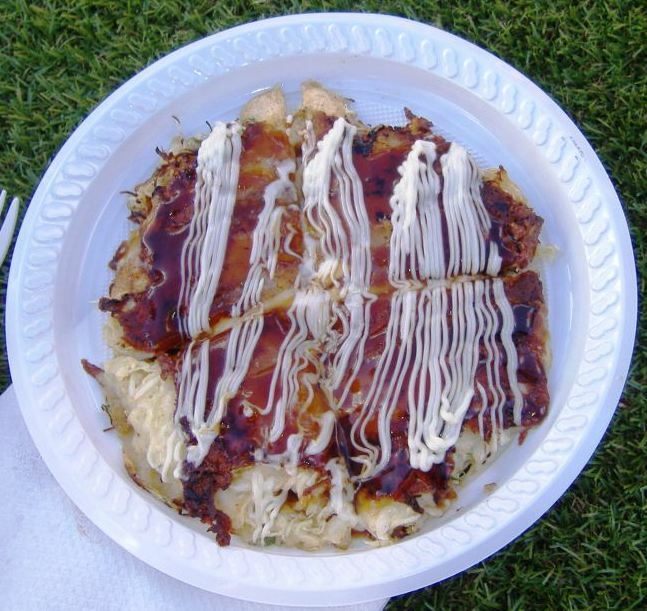 Anyone and everyone’s taste can be catered for as there is cuisine from all over the world. There are more choices on offer than I have ever experienced in any other market type venue anywhere in the world. It was a fantastic night and just so easy. Imagine sitting by the Brisbane River enjoying an inexpensive meal and catching the nice cool breezes. We were spoilt for choice as there were so many delights from Asian, South American, French, German, Hungarian, Italian, Turkey, the list is endless. We chose the Japanese pizza, mostly from curiosity and even though it was yummy it was a little too rich for me. I also had my first potato slinkie, very nice . They would go great with a cold beer or glass of wine. I then ended with a gelato. The Italian Connection. I will be going back to these markets often and eat my way around the entire markets. It will take a very long time but it will be a lot of fun. The “pop up shops” also offer a wonderful browse and include: herbal soaps, jewellery, clothing, art, flower arrangements, homewares, and much much more. 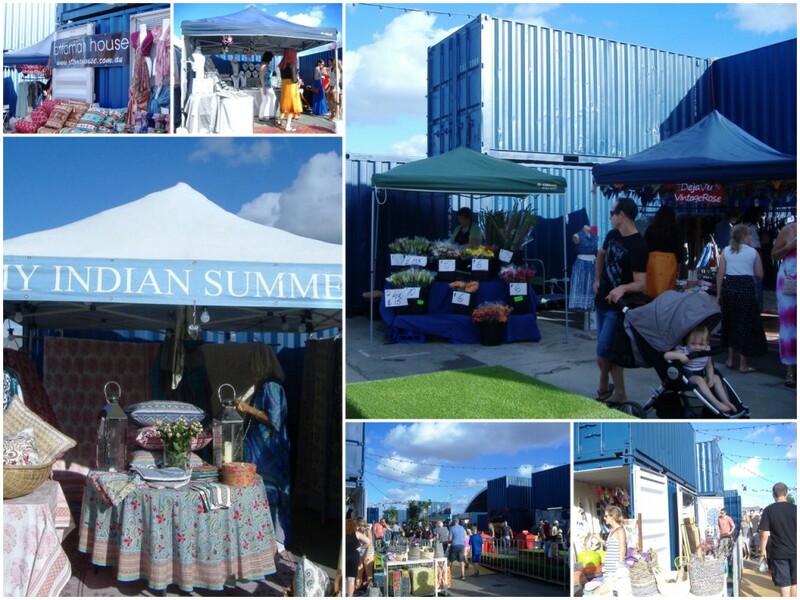 There was plenty of free parking nearby and the markets are a short stroll from the Portside cruise terminal. These amazing Asian style bustling markets are only open on Friday and Saturday nights and offer a great night out for all ages. They are a must see.